The Compur is a long-lived series of leaf shutters that were made by the German company F. Deckel, based in München. The Compur appeared in 1912 and was based on the Compound, but was equipped with a geared slow speed governor instead of a piston and cylinder device. 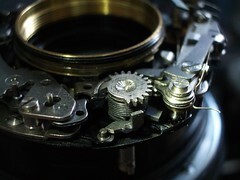 The first Compur shutters were dial set. This means that the speed setting is by way a rotating dial at the top of the shutter plate. The later models were rim set, with a speed setting rim around the shutter housing. The Compur shutters are equipped with a self-timer from 1928. The Compur-Rapid is a model released in 1935, attaining 1/500 in #00 size and 1/400 in #0 size. After the war, the Synchro-Compur added an MXV synch selector. ↑ Shunkan o torae-tsuzukeru shattā-ten, p. 6. ↑ Date: Shunkan o torae-tsuzukeru shattā-ten, p. 6.